They fight and spy for America abroad. But what happens when drones return home? A few months ago I borrowed a drone from a company called Parrot. Officially the drone is called an AR.Drone 2.0, but for simplicity's sake, we're just going to call it the Parrot. The Parrot went on sale last May and retails for about $300. It's a quadcopter, meaning it's a miniature helicopter with four rotors; basically it looks like a giant four-leaf clover designed by Darth Vader. It's noisy and a bit fussy: it spits error messages at you from a comprehensive menu of them, and it recovers from catastrophes slowly and sulkily. (Pro tip: quadcopters mix poorly with greenery.) But when it's on its best behavior, the Parrot is a little marvel. You control it with an app on your smart phone, to which it feeds real-time video in return. Mashing the Take Off button causes it to leap up to waist height and hover there, stock still, in the manner of Harry Potter's broomstick. It's so firmly autostabilized that on a hot day small children will gather under it to get the cool downwash from its rotors. It's a toy, the robotic equivalent of a house pet. But just as cats and dogs are related to tigers and wolves, the Parrot is recognizably genetically related to some very efficient killers. Flying a drone, even just a Parrot, makes you realize what a radically new and deeply strange technology drones are. A drone isn't just a tool; when you use it you see and act through it  you inhabit it. It expands the reach of your body and senses in much the same way that the Internet expands your mind. The Net extends our virtual presence; drones extend our physical presence. They are, along with smart phones and 3-D printing, one of a handful of genuinely transformative technologies to emerge in the past 10 years. They've certainly transformed the U.S. military: of late the American government has gotten very good at extending its physical presence for the purpose of killing people. Ten years ago the Pentagon had about 50 drones in its fleet; currently it has some 7,500. More than a third of the aircraft in the Air Force's fleet are now unmanned. The U.S. military reported carrying out 447 drone attacks in Afghanistan in the first 11 months of 2012, up from 294 in all of 2011. Since President Obama took office, the U.S. has executed more than 300 covert drone attacks in Pakistan, a country with which we're not at war. Already this year there are credible reports of five covert attacks in Pakistan and as many as eight in Yemen, including one on Jan. 21, the day of Obama's second Inauguration. The Pentagon is planning to establish a drone base in northwestern Africa. The military logic couldn't be clearer. Unlike, say, cruise missiles, which have to be laboriously targeted and prepped and launched over a period of hours, drones are a persistent presence over the battlefield, gathering their own intelligence and then providing an instantaneous response. They represent a revolution in the idea of what combat is: with drones the U.S. can exert force not only instantly but undeterred by the risk of incurring American casualties or massive logistical bills, and without the terrestrial baggage of geography; the only relevant geography is that of the global communications grid. In the words of Peter Singer, a senior fellow at the Brookings Institution and the author of Wired for War: The Robotics Revolution and Conflict in the 21st Century, drones change "everything from tactics to doctrine to overall strategy to how leaders, the media and the public all conceptualize and decide upon this thing we call war." Having transformed war, drones are getting ready to transform peace. A year ago Obama ordered the Federal Aviation Administration (FAA) to expedite the process of integrating "unmanned aerial vehicles," as drones are primly referred to within the trade, into civilian airspace. Police departments will use them to study crime scenes. Farmers will use them to watch their fields. Builders will use them to survey construction sites. Hollywood will use them to make movies. Hobbyists will use them just because they feel like it. 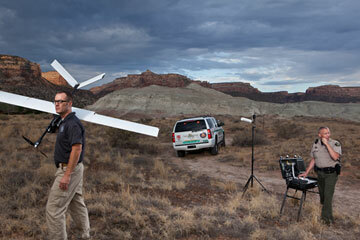 Drones are an enormously powerful, disruptive technology that rewrites rules wherever it goes. Now the drones are coming home to roost. They've been on their way for some time. If you define a drone as any remote-controlled device that can spy or fight from a distance, they go back over 100 years. Nikola Tesla patented a wirelessly remote-controlled powerboat in 1898. The U.S. built unmanned, gyroscopically stabilized biplanes during WW I, though it never put one in the field. During WW II a company called Radioplane manufactured drones for target practice; Marilyn Monroe worked there until she was spotted on the job by an alert Army photographer.